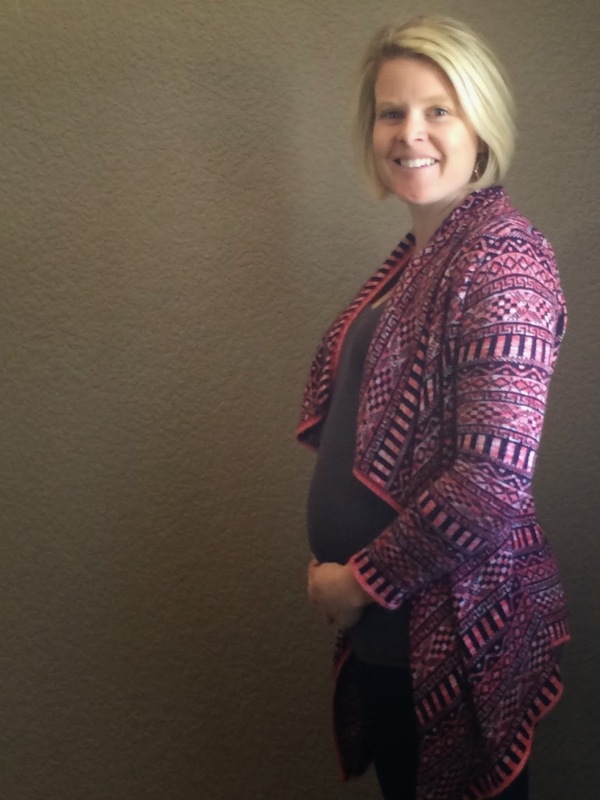 Total Weight Gain/Loss: at the perinatal office I was up 8 lb. 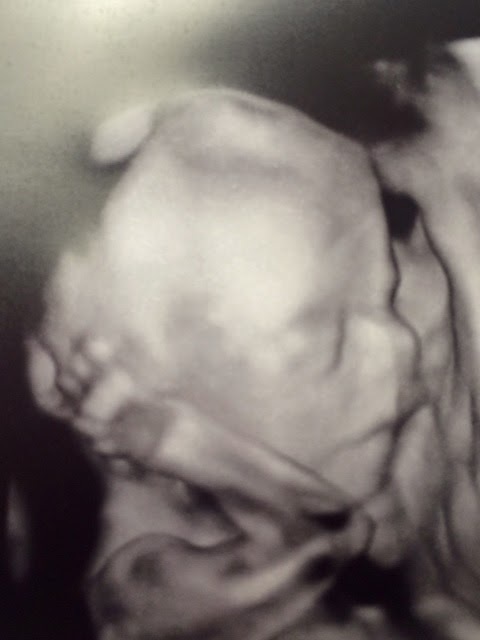 Movement: At the ultrasound, baby went from head down ready to birth position to head up towards my stomach in one hour. As Scott said, no wonder I feel nauseous, baby is VERY VERY active. It does feel like I am on a roller coaster when he/she gets going. Occasionally I can feel the kick on the outside but it is still so hit or miss, no one else has yet! Sleep: you should see me roll over, it's a tragic comedy...my hips and back are certainly feeling this baby! Symptoms: I cannot shake the pukes! I am sick at least 3-4 times a week losing a whole meal and I normally need to go to bed or nap to get rid of the feeling. I also have puked up my nausea meds which is annoying. I try not to take them all the time and try to read my body symptoms, I can normally tell when something isn't going to stick around unfortunately, it's just a matter of timing it right to get the meds in before everything exits. I don't take the meds all the time as you may have read about zophran and its possible serious side effects for babies in utero. Unfortunately, it is the ONLY medicine that seems to help at all. It also constipates me SEVERELY! The perinatologist also scolded me for eating too many granola bars which apparently will also stop you up. Granola bars don't generally hurt my tummy so I eat one right away in the morning...but I am trying to limit them from there ;). 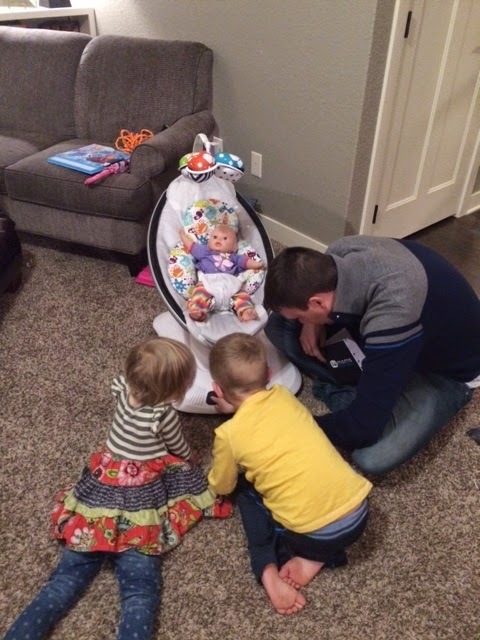 What do the kids think: We got our first gift from my parents, a MamaRoo, not a necessity but will be nice when I need my hands free. Thanks Mom and Dad! The kids were all excited to test it out with Vera's dolls and check out all the features ;). We had to put it away for now, it was too tempting to play with. They loved the ultrasound, albeit it was a bit long and Solon was unhappy he was outvoted in not finding out. We told him when he is the dad, he can find out ;)! On my heart: The ultrasound is always a good reminder that there is in fact a baby in there and that we are going to have another child very soon! Being so busy with the other two, tired and still sick I don't have as much time to plan and dream as I did with #1 and even #2 but my friends assure me that I love them the same, even if I don't think about them as much (talk about mom guilt!). The old wives tales are 50/50 and the Chinese Gender Predictor says girl (it was correct with our other 2), Scott is leaning towards girl and everyone else is also 50/50. We are all just glad baby is healthy and how exciting it will be on B-Day! and in case you want to compare (although the others are both at 28 weeks), look HERE.